Dine Out Our area is known for remarkable seafood and you can enjoy it at a number of local restaurants cooked just the way you like it. Restaurants can range from Mexican, Italian, and Thai to Cajun, Asian and good ole' American can be found in Navarre as well. Cactus Flower Cafe is a Mexican restaurant with locations in NW Florida and Alabama taking great pride in serving delicious California Style Mexican Cuisine. Our Mexican food is fresh, flavorful, delicious and healthy � served in a relaxing and appealing atmosphere. From our fabulous appetizers and entrees to our incredible desserts and award winning margaritas, all made in-house, to our vast wine menu � you�re certain to enjoy your dining experience at Cactus Flower Cafe! Bienvenidos! Sailors` Grill and Juana`s complements the beach atmosphere, geared to the no shirt, no shoes, no problem family destination serving beach goers breakfast, lunch and dinner, seven days a week. Sailors` Grill is known for popular signature desserts, including the award-winning "Best Buns on the Beach" and our Key Lime Pie is famous far beyond Navarre Beach and Florida. The recipe is still a secret-but can be enjoyed anytime you visit. Sailors` Grill Restaurant and Bakery on Navarre Beach is proud to be a SLOW food restaurant. Every menu item is prepared to order and requires a little extra time. Enjoy the beautiful beach and company of your family and friends while dining at Sailor`s Grill. You`re on island time. Please enjoy-this is the beach after all. The East River Smokehouse signature way of cooking meat starts with applying our own family signature seasonings. After that we go on to smoke our meat for 18 hours at 250+ degrees. We believe that your BBQ should have that "right out of the smoker" taste, so we do just that! Once you dig into our tender and juicy meat, you`ll notice a slight pink smoke ring around the meat. This comes from our signature hardwood smoked process. To top off all of our signature BBQ dishes, we suggest that you try our homemade BBQ sauce to add that extra kick of deliciousness to your meal! The Shrimp Basket is a family, friendly restaurant that originated in Gulf Shores, Alabama in 1993, just two blocks north of the white sandy beaches. The concept of the first Shrimp Basket started in what once was a yogurt shop and is still going strong in Gulf Shores. Shortly thereafter, the location in Perdido Key was opened successfully and was followed by 18 more locations in and around Navarre Beach. Our menu encompasses a great variety of original seafood and local favorites. Ranging from shrimp, fish, crab claws, and crawfish, we also provide po-boys, chicken, and sandwiches for land lovers. Don�t forget about our specialty Roasted Red Pepper Bama Sauce over Fettuccine pasta! Check out the menu and see our daily specials! The goal at the Shrimp Basket is to provide enjoyable, affordable service to each and every one of our guests at whichever restaurant they choose to dine in. This is accomplished by our professional and well-trained staff working together to ensure that your memories are the best that they can be at the Shrimp Basket. It is no surprise that our popularity has magnified among locals and tourists alike as we continue to expand along the Gulf Coast. We are grillin�, steamin�, and fryin� for you! Restaurant, Beach & Gift Shop. Inspired southern style in Pensacola Beach, Florida. Simple good food from local ingredients. We invite you to relax and enjoy friends and family and the waterfront view in our backyard. 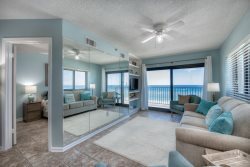 We have the best �backyard� on the Pensacola Beach with two white sand beaches, covered and grassy dining areas, lots for the kids to do, and a stylish cocktail bar. It�s without a doubt the best place on the island to watch a sunset; located �soundside� right across the street from the Hilton Hotel. Don�t miss the gift shop. It�s not your typical souvenir store and you�ll be surprised at what your find. Buy a #RFBF travel cup and get free soda and iced tea refills for life. Creekside Southern Grill Seafood Restaurant and Steakhouse is Navarre�s top dining experience for lunch, dinner and Sunday brunch. Our lounge and formal dining room are lined with floor to ceiling windows that offer a fantastic view of Hidden Creek Golf Course and Navarre�s sunsets. Our lunch menu showcases great Southern favorites, hand pattied hamburgers, locally caught gulf seafood, fresh made sandwiches, salads, soups and gumbos. Our dinner menu showcases an eclectic blend of Louisiana Creole, French and Modern Southern cuisine. Our chef believes in cooking from scratch with locally sourced ingredients including farm fresh produce, locally caught seafood and fresh herbs. On the weekends, we have a special brunch menu with traditional Southern brunch favorites and some of Chef Jason�s most creative dishes. Brunch is served Saturday & Sunday from 10 AM � 2 PM. Our Chef loves to create weekly specials for lunch, dinner & brunch that excite your taste buds and warm you down deep where only down home, farm fresh Southern cooking can reach. We honor our hometown heroes with 15% OFF on Wednesday nights and have a $35 3-Course Couples Menu for that romantic night out with your special someone.